In the context of career development, networking is the process by which people build relationships with one another for the purpose of helping one another achieve professional goals. When you “network,” you exchange information. You may share business cards, résumés, cover letters, job-seeking strategies, leads about open jobs, information about companies and organizations, and information about a specific field. You might also share information about meet-up groups, conferences, special events, technology tools, and social media. You might also solicit job “headhunters,” career counselors, career centers, career coaches, an alumni association, family members, friends, acquaintances, and vendors. Networking can occur anywhere and at any time. 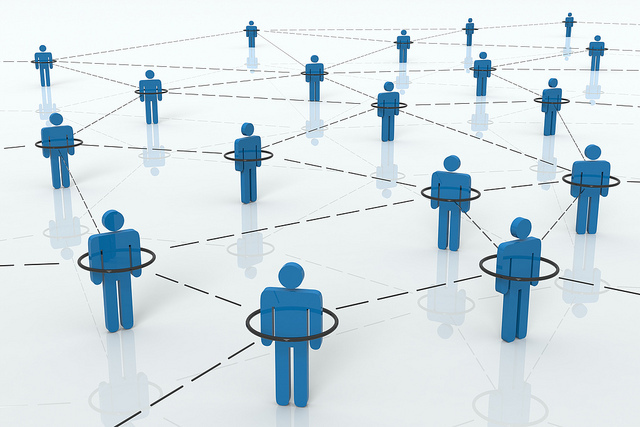 In fact, your network expands with each new relationship you establish. And the networking strategies you can employ are nearly limitless. With imagination and ingenuity, your networking can be highly successful. We live in a social world. Almost everywhere you go and anything you do professionally involves connecting with people. It stands to reason that finding a new job and advancing your career entails building relationships with these people. Truly, the most effective way to find a new job is to network, network, and network some more. Once you acknowledge the value of networking, the challenge is figuring out how to do it. What is your first step? Whom do you contact? What do you say? How long will it take? Where do you concentrate efforts? How do you know if your investments will pay off? Hope is not a plan. You need a plan of action to achieve your networking goals. Keenly focus your activities on getting a job. Use all tools available to you. You need business cards. No ifs, ands, or buts. Register your own domain name. Find your favorite geek to build you a landing page. Keep building your site for the rest of your life. Attend networking events. Most of them offer student rates. Master Linkedin because that is what human resource departments use. Post updates. Think of your parents’ friends as databases. Leverage their knowledge and their willingness to help you. See the LinkedIn for Students Web site. If you are an international student, or perhaps if English is not your native language, this video may especially appeal to you. It focuses on the importance of networking when looking for jobs and keeping an open mind. Simply talking to people can help you move from casual work to full-time employment. Get to know your professors: Communicating with instructors is a valuable way to learn about a career and also get letters of reference if and when needed for a job. Professors can also give you leads on job openings, internships, and research possibilities. Most instructors will readily share information and insights with you. Get to know your instructors. They are a valuable part of your network. Check with classmates: Classmates may or may not share your major, but any of them may have leads that could help you. You could be just one conversation away from a good lead. Join professional organizations: You can meet many influential people at local and national meetings and events of professional and volunteer organizations. Learn about these organizations. See if they have membership discounts for students, or student chapters. Once you are a member, you may have access to membership lists, which can give you prospective access to many new people to network with. Volunteer: Volunteering is an excellent way to meet new people who can help you develop your career, even if the organization you are volunteering with is not in your field. Just by working alongside others and working toward common goals, you build relationships that may later serve you in unforeseen and helpful ways. Get an internship: Many organizations offer internship positions to college students. Some of these positions are paid, but often they are not. Paid or not, you gain experience relevant to your career, and you potentially make many new contacts. Check CollegeRecruiter.com for key resources. Get a part-time job: Working full-time may be your ultimate goal, but you may want to fill in some cracks or crevices by working in a part-time job. Invariably you will meet people who can feasibly help with your networking goals. And you can gain good experience along the way, which can also be noted on your résumé. Join a job club: Your career interests may be shared by many others who have organized a club, which can be online or in person. If you don’t find an existing club, consider starting one. Attend networking events: There are innumerable professional networking events taking place around the world and also online. Find them listed in magazines, community calendars, newspapers, journals, and at the Web sites of companies, organizations, and associations. Conduct informational interviews: You may initiate contact with people in your chosen field who can tell you about their experiences of entering the field and thriving in it. Many Web sites have guidance on how to plan and conduct these interviews. Participate in online social media: An explosion of career opportunity awaits you with social media, including LinkedIn, Twitter, Facebook, Instagram, Pinterest, and many more. You will find an extensive list of suggested sites at CareerOneStop. Keep your communication ultra-professional at these sites. Peruse magazine articles, and if you find one that’s relevant to your field and it contains names of professionals, you can reach out to them to learn more and get job leads. Use business cards or networking cards: A printed business card can be an essential tool to help your contacts remember you. Creativity can help in this regard, too. Students often design cards themselves and either hand print them or print them on a home printer. Find information about five companies or people in your field of interest, and follow them on Twitter. Get an account at four social media sites that you’ve not yet been active with that may enhance your career. Find names of three people who interest you (peruse magazine articles, online sites, or other resources), and write an email to them explaining your interests and any requests you may have for information. Sign up for newsletters from two professional organizations in a field you want to know more about. Find and attend one in-person or online event within a month. Now write about this experience at one of your social media sites.